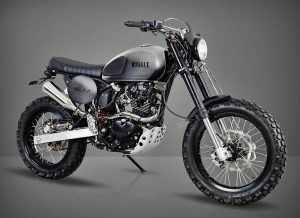 There could be no better way to start 2017 than with the news of the imminent release from Bullit Motorcycles. The Belgian motorcycle-manufacturer offered a glimpse of their latest Bullit Hero 125 bike. The bike is doused in style and packed with performance. Every modern machine draws inspiration from a legend, the Hero 125 is said to be inspired by the classic British style of motorcycle builds, think the likes of Commando or the BSA A65 Star. The design may look back into the past but the performance and technology are futuristic. The grand unveiling of the bike is slated for the month end. The Hero 125 is Euro4 compliant and here is what is known of the bike. Although, the actual specifications of the bike still remains a mystery, here is the information which is already available. The bike, slated for an early 2017 release, has already sold over 70% of the pre-stock. The Bullit Hero 125 is a classic European bike packed with masculine charm and distinctive performance. The engine is a mono cylinder, 4-strokes with a displacement of 124cc. The maximum power output is at 8.4 kW at maximum torque of 9500rpm. The transmission is 5-speed with a modern electric start. The maximum fuel capacity is at 10.6 litre. The bike weighs about 119 kilos (dry weight) and the seat height is at 890mm. While the bike possesses modern technological inclusions, Hero 125 exudes its retro style by retaining a completely analog display system. The bike has impressive suspension stats. The front suspension is USD telescopic 43mm. The rear suspension is spring coiled. Both front and back brakes are wavy discs. The bike is priced at £2,400 (speculative price). Bike giants are synonymous with the more popular superbikes or tourers. A little is known of the exclusive club of small displacement motorcycles. Retro-looking motorcycles have a huge demand in France and UK. These bikes are economical and an overall fun ride. The Bullit manufacturers admit that a great inspiration is drawn by combining legendary styling with best in class technology which makes the bike a joy to ride. The bike offers a safe ride as well. Other impressive bikes from Bullit include the Hunt 125 series. The Hunt 125 Series is available in 5 exclusive colours and has similar specifications as the Hero 125. The difference is the braking system which is drum and the Hunt 125 and wavy disc in the Hero 125. Both have an electric start and equal engine capacity. Also in the Hunt Series is the powerful 250cc Hunt S 250. The engine of this bike, owing to enhanced power, is air cooled. The power output peaks at 20Pk at 7500rpm or 2MKG at 6000 rpm. The braking system is different. Here it is controlled by 295mm Single Disc brakes. Apart from an electric self-start, the Hunt S 250 also offers a backup kick start. A complete specification of the Bullit Hero 125 will only be available post its official release.